Today my bear necklace broke. It’s an etched pendant of a bear on a silver chain that Chuck got me after my beloved dog, my soul mate, Bear, died a few years back. I only had her a few years. She was eleven when I adopted her. She died a year and a half later. There has never been a dog I was so in tune to…and let me tell you I have fostered and owned too many to count. She was my doggy soulmate. Since getting my bear necklace I never took it off…ever. It made me feel closer to my Bear somehow. She was always right close to my heart. When it broke it was literally just minutes after reading another mean email from the same person who seems to not want to go away. My first thought was: great something else to go wrong, and I looked at the broken necklace in my hand and stared at the beautiful image of a bear. I set it down and a “knowing” came over me. It was time to let Bear go. I needed to move on to the present. Mind you I have been living in the present and practice mindfulness daily. But I suppose maybe I was hanging on just a bit too tight to Bear and maybe Bear, always wise, was showing me. She’ll always be in my heart anyway and I’ll see her again some day. 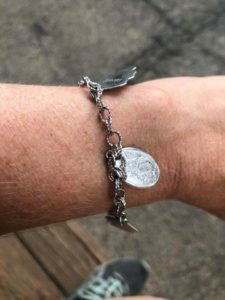 So as I was in the bathroom getting ready this morning I rummaged through some random jewelry I had on a shelf and was drawn to a charm bracelet that I had made about 20 years ago. I looked at it and remembered that for more years than I could remember I was actually repelled by it because it made me sad at that time. Charms of my kids, now grown, life for them has been hard. But this morning I looked closer and I saw the younger hopeful Sandy that picked out the charms. A boy and girl with their names etched in it, a dog, a home, a American flag and a charm of an angel. My heart, who I am, really hasn’t changed at all in 20 years. But now rather than being sad about my kids or thinking about what could have been but didn’t I have found myself in a place of humble gratitude. So for a little while I’ll wear this bracelet and put my Bear necklace in a drawer. Life has given me what I need to learn, grow to be a better person. My sweet Bear is no longer with me here and now but my kids are, my dogs are, my home, my country and even angels. That’s what I’ll concentrate on. Ever the wise, Bear, my angel dog.